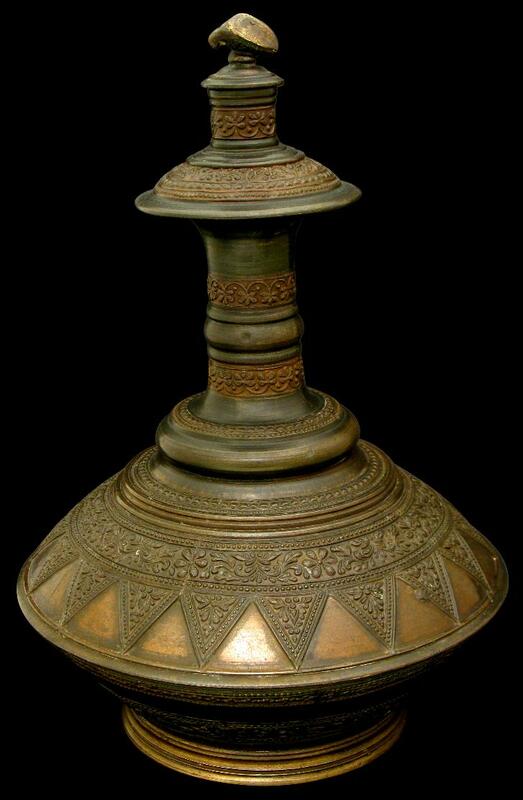 This lovely example of Malay brassware cast using the lost wax process features repeated stylised bamboo shoots (pucuk rebung) filled with floral motifs separated by raised triangular plaques and various other borders of flowers and geometric designs. motifs are an identifying characteristic of Malay brassware. They are also commonly used in Malay textile design and woodwork. This example has the original stopper which has been cast in the shape of a peahen. Comparable examples are in the collections of the National Museum of Singapore and the Islamic Arts Museum Malaysia. Items used to hold and store water were a feature of Malay households. Unlike the Muslims of the Middle East for whom it was important to boil water to purify it, the Malays believed that allowing water to stand for several days cleansed it, hence the need for such containers. Water containers and kendis with similar motifs appear in Singh, B., Malay Brassware, National Museum of Singapore, 1985, p. 24, and Islamic Arts Museum Malaysia, The Message and the Monsoon: Islamic Art of Southeast Asia, IAMM Publications, 2005, p. 203.